Israel and the Palestinian Authority have agreed to a series of "concrete steps" to ease Palestinians' lives in the West Bank, US officials have said. Israel has pledged to remove about 50 roadblocks in the West Bank, while the Palestinians have pledged to step up their efforts to "prevent terror". More than 500 other obstacles blocking Palestinian movement will remain. 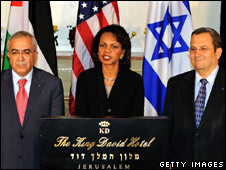 The US statement came after Secretary of State Condoleezza Rice met Israeli and Palestinian leaders in Jerusalem. Ms Rice is trying to re-energise the peace process, which was re-launched following a US-sponsored conference in Annapolis in November. The negotiations appear to have lost all momentum and there has been little sign of tangible progress, the BBC's Jon Brain in Jerusalem says. Late on Saturday, an Israeli air strike killed two Palestinian militants near Jabaliya in the northern Gaza Strip. The territory has been controlled by the Islamist movement, Hamas, since June. Hamas is shunned both by the US and Israel, which consider it a terrorist group. After Ms Rice held talks with Palestinian Prime Minister Salam Fayyad and Israeli Defence Minister Ehud Barak, the US state department issued a statement saying the two men had "agreed on concrete steps to implement the road map", which envisages the creation of an independent Palestinian state. "This is a programme that will improve the daily lives of Palestinians and help make Israel secure," it said. 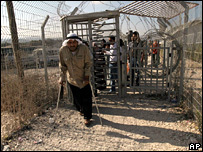 The US statement said Israel had "pledged to reduce the impediments to access in movement in the West Bank". "This will begin with the removal of about 50 roadblocks and immediate steps to upgrade checkpoints to reduce waiting time without compromising security," it added. The statement did not mention which roadblocks would be removed, saying only that Israel would focus on "points of special immediate emphasis". Israel maintains hundreds of checkpoints, roadblocks and other barriers in the West Bank, which it says are necessary to prevent attacks on Israel and Jewish settlements. Palestinians say the restrictions constitute collective punishment. UN officials have said the number of obstacles in the West Bank has increased since the peace process was restarted last year. The US said the two sides had also agreed that Palestinian security forces had to assume "greater responsibility" for security in the West Bank. Six hundred Jordanian-trained members of a security force loyal to Palestinian Authority President Mahmoud Abbas will be allowed to deploy to the northern West Bank city of Jenin and "work to prevent terror", it added. The statement also said the two sides had agreed to take new steps to promote economic development in the West Bank, and to build new housing for Palestinians in 25 villages in the region. After meeting Ms Rice earlier on Sunday, Israeli Foreign Minister Tzipi Livni said her government was prepared to act "to ease the lives of the Palestinians" in the West Bank. She also backed the idea of offering compensation to Israeli settlers who voluntarily want to leave their homes in the West Bank. Ms Rice then flew to the Jordanian capital, Amman, for a meeting with President Abbas. She is hoping significant progress can be achieved before US President George W Bush's visit to the region in May. Mr Bush has expressed confidence in a framework peace agreement being reached before he leaves office in January. However, few Israelis or Palestinians share his optimism, our correspondent says.